My guess is you don't know people with schizophrenia who have jobs, own their homes, are married and join clubs and congregations. My guess is, even if you work in the field or volunteer in homeless shelters, you do not count among your friends, your real friends, the ones you invite to your house for dinner, anybody with schizophrenia. My guess is you do not know that such a thing is possible. Lionel Aldridge decided to change that. Lionel Aldridge played defense for the Green Bay Packers and won two Super Bowl rings. (Go Cheeseheads!) He lost them when schizophrenia took his life out of control. Literally, his ring fell off his hand; he couldn't find it in the gutter. But he came back. He got treatment. He vowed that if he got better, he would not remain silent, so that other people with schizophrenia would know they are not alone, so they would know they could recover, and so you would know that, too. His story is in this link. Most research in schizophrenia has as its eventual goal the development of treatments. Starting with a general theory, researchers develop a testable hypothesis. Then using a deductive method, conducting experiments with placebos and controlling for variables, they ask, Does this medicine, or this therapy reduce this symptom? There is another way to do research, using an inductive method. Starting with specific examples, case studies, researchers search for patterns. For example, they find people with a particular mental illness, yet who function well and have full lives, and ask them, How do you do it? Sarah Russell did inductive research with people who have bipolar, and wrote A Lifelong Journey: Staying well with Manic Depression/Bipolar. It's a revolutionary concept, that people with bipolar can stay well, and that we are the experts on how to do it. Within the scientific community, people with schizophrenia are seldom taken as experts on their recovery. Keris Myrick [see below] is part of one study that is an exception. Usually Prozac Monologues reports on deductive research. However, this post takes an inductive approach. While I am introducing you to people who have schizophrenia who have jobs, families, connections, I invite you to examine their stories asking Russell's question, How do you do it? Aldridge was a start. Reread his story, noting the difference between the voices of schizophrenia and the voice of God. I wrote about telling the difference a couple weeks ago. Aldridge could tell the difference. His Bible and the voice of God supported his recovery. People with schizophrenia are frequently encouraged to set their sights low. Stress and overstimulation do exacerbate psychotic symptoms. People who want to work are herded toward sheltered workshops. Keris Myrick wouldn't go there. She instinctively knew she needed challenge. She needed to use her management and computer skills. When she gets in trouble, she finds that a luxury hotel works better for her than a hospital. Imagine that! The thing is, people do not usually transition from sheltered workshops to real jobs. They stay in sheltered workshops. The University of Iowa Hospital and Clinics supported Margalea's employment. They held her job for her back in the days when she was in and out of the hospital. They gave her rehabilitation and training. That support has paid off. Margalea is an author, an active church member, and a public speaker and educator about mental health issues. She runs support groups. She trains prison guards. That's in her spare time, after putting in forty hours a week at her real job with an enviable benefit package. 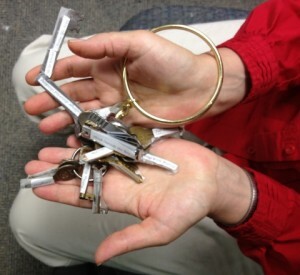 Last year to celebrate seventeen years since her last hospitalization, Margalea collected seventeen keys from her friends. Keys -- what people have who can come and go from the psych ward at will. She wrote of seventeen keys/strategies for recovery. Here is her story, published first on the Anabaptist Disabilities Network website, and later as a guest blogger at Prozac Monologues. The keys, a wide variety of strategies, are her answer to How do you do it? Prana, in Ayurvedic philosophy, is the life force and energy, intimately connected with breath. Tom Harrell, prolific composer, arranger, jazz trumpeter and voice of Snoopy and Woodstock on Peanuts tv specials, credits the disciplined breathing of trumpet playing in his healing. He repeats two of Margalea's keys, nutrition and work. In his case, music also is food. Not to suggest that any special virtue adheres to a diagnosis, I include John Nash to complete this post. Abrasive is a word that one of his friends uses to describe him. Myself, I cringe at this youtube and others I have watched, to see a brilliant and overachieving father disappointed in his brilliant but underachieving son -- something that has nothing to do with schizophrenia and everything to do with fathers and sons. Nash reminds me once again not do make generalizations. In Nash's case, he says he reasoned his way out of his symptoms. He became disillusioned with his delusions -- a line that hearkens to Cognitive Behavioral Therapy, with its techniques of inference chaining and peripheral questioning. In the case of living well with bipolar, Russell discovered that medication was part of the picture, but ranked after life style issues, support and therapy. Life style is number one, and regular schedule the top within the category. These results suggest strategies for managing bipolar that are less toxic than the medical attempts simply to flatten mood swings. They also suggest other directions for deductive-type research, beyond neurotransmitters. Similarly, stories from people with schizophrenia, mined in deeper detail than I have done here, can yield strategies that reduce the dosage of toxic chemicals with their cognitive consequences. Again, the inductive studies can suggest other foci of deductive research. Not all the action is in neurotransmitters. Perhaps even more significantly, lessons learned from those who are doing well can provide direction for a more broadly-based recovery, addressing more of the limitations of the illness, and providing a framework in which the gifts of these brilliant human beings can be released. Meanwhile, now you do know a few of them. Thank you, Willa. Your blog is a blessing to me.